Railway Preservation News • View topic - Al Nippert & New Georgia: What Did They Own? Al Nippert & New Georgia: What Did They Own? Post subject: Re: Al Nippert & New Georgia: What Did They Own? 1. What was the method used for New Georgia's numbering system? Well, it started out simple. Keep in mind that the original equipment acquired from the Hartwell Railroad was a mix of 4- and 6-axle HW and LW equipment. Throw in cars loaned from CSX and others leased from the Atlanta Chapter NRHS/Southeastern Railway Museum (in addition to the mainline motive power) and you have a hodge-podge of equipment. The earliest roster I have dates from approximately late 1985, and was later revised in April 1986. There are additions to the 1986 data sheet compared to the 1985 sheet. The next roster info I have was printed in the Trains February 1989 issue. Again, there are additions, and some deletions, or at least omissions of some equipment that I know was there before. Some basic history, for the record. First, I'd recommend reading Steve Glischinski's well-written article "Looping Atlanta" in that Feb. 1989 Trains, pp. 42-52. There's a lot of good info in there, but there are a few inaccuracies as well, but not many. What follows, though, is what I remember from my involvement with the New Georgia in 1985-1986 as a GBA employee and from following it in later years until my "real work" kept me too busy to keep up. The concept of the New Georgia Railroad was the brainchild of then-Georgia Building Authority Director Steve Polk. Mr. Polk, as the story goes (and was recorded in a series of TV news stories by Channel 5 reporter Leroy Powell), decided that since the historic Georgia Railroad depot had recently been restored, the state ought to have a train to go with the depot. It would be used to carry all the "little school children" around when they come to Atlanta to visit the capitol, amongst other things. He presented his idea to the Atlanta Chapter NRHS in August 1984 after getting the idea from a fundraiser in mid-1984 for the Callanwolde Fine Arts Center. The idea gained traction when Seaboard System wanted to take the Georgia Railroad's Hulsey Yard and rebuild it into a modern intermodal terminal. This activity was taking place in mid-late 1984 and actually included a proposal to take the famous Civil War locomotive GENERAL out of the Big Shanty Museum in Kennesaw, GA to be rebuilt for the endeavor. Of course, the original "endeavor" was not nearly as expansive as it ultimately became. 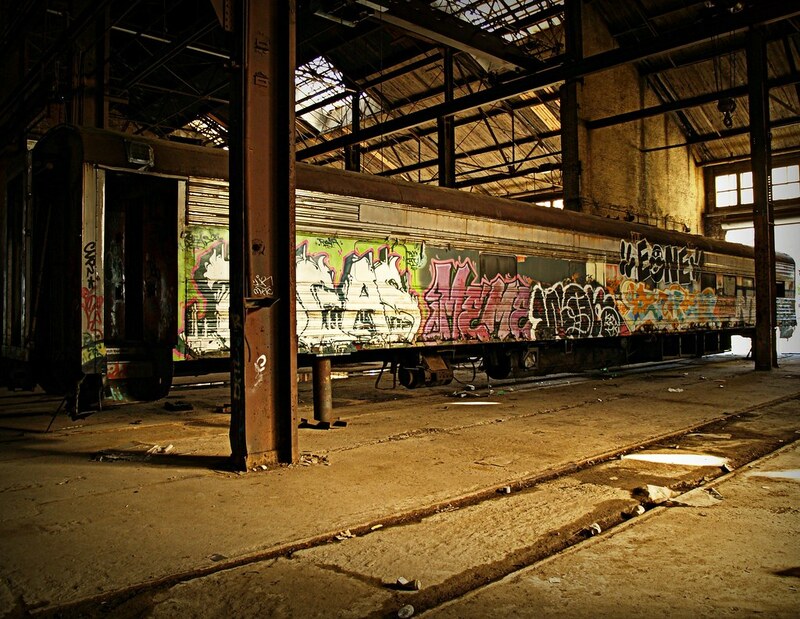 With the State Legislature, the City of Atlanta and CSX all coming to a point of agreement, the prospect of the new operation seemed positive. Amid the objections of many, the idea of using the GENERAL eventually went away. An editorial published in the Sunday Dec. 16, 1984 Journal-Constitution, written by Wilbur G. Kurtz, Jr. a grandson of Capt. William A. Fuller, the Western & Atlantic conductor who led the chase after the GENERAL when it was stolen at Big Shanty on April 12, 1862, was headlined "Being tourist train would disgrace 'General'". The issue smoldered into 1985 with another guest editorial, this time by Col. James G. Bogle, with the headline "Let General and the Texas rest in peace in museums." This was published January 27, 1985. Col. Bogle suggested using A&WP 290 instead, and the Atlanta Chapter suggested this to the GBA. Mr. Polk met with Seaboard System President Richard Sanborn and told him the GBA was going to lease 290 for the train, but Mr. Sanborn suggested leasing 750 instead, primarily because of the cost of restoring 290 to operation. Perhaps coincidentally, earlier in January the 75th birthday celebration of Savannah & Atlanta 750 (ex-FEC 80) had included trips between Underground Atlanta and Hulsey Yard on Saturday January 12, 1985. On April 3, 1985, the Atlanta Journal-Constitution reported that the state was nearing completion of plans to buy the Hartwell Railroad equipment from owner Frank Pollock, Jr. for $175,000. Pollock had decided to sell the equipment saying "I didn't have enough money to develop it sufficiently out here." Steam locomotive Hartwell No. 11 (2-6-2, ex-Reader Railroad) was originally part of the acquisition, but by this time the Atlanta Chapter had agreed to let the state use S&A 750, so No. 11 stayed in Hartwell to later be rebuilt and occasionally operated again beginning in early July 1988. I don't know details of the Hartwell purchase or the timing of the equipment move, but the newspaper reported that the first trip was planned for June 1, 1985, "a 45-minute trip around Atlanta as part of a fund-raiser for the Callanwolde Fine Arts Center." Now, as for the numbering system, the best you can say is it started simple but evolved. Basically, 6-axle heavy weight passenger cars were numbered in the 1100 series. The 4-axle HW DL&W cars were the sole occupants of the 1200 series. There were no cars numbered into the 1300 series. (Superstition?) The former SR RPO that was not used in service, but was the "yard office" for the NGRR was the sole occupant of the 1400 series. Stainless steel LW cars were all numbered in the 1500 series, while the smooth-sided LW cars were in the 2000 series. For some reason stainless LW car 1509 was renumbered 1964. Stainless LW car 1508 became Coca-Cola lounge No. 100. They were obviously two different types of cars with the HW cars having 3-axle trucks and the DL&W cars having 2-axle trucks and so were numbered into separate classes. In addition to these five cars was Southern Ry. 34, which came to the Hartwell from the Heart of Dixie Chapter NRHS. 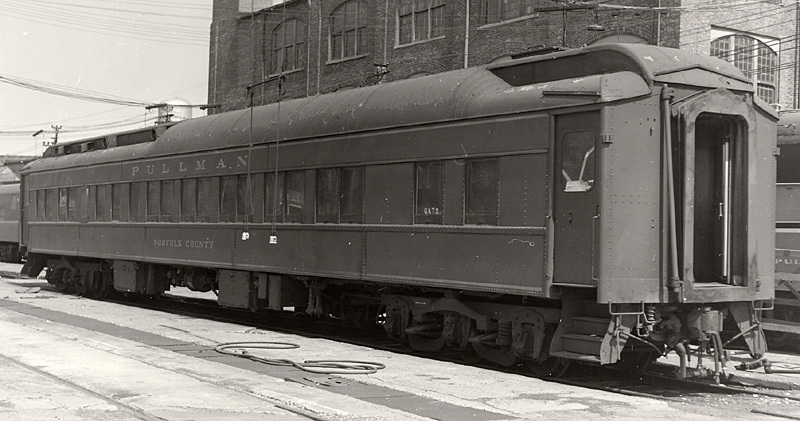 Since this 4-axle car was going to be used as the yard office at the Pullman Shops it was renumbered 1401 rather than in the 1200 series. The first LW car also came from the Hartwell, the former SLSW diner No. 1550 "Tulsa". This was listed as a lounge and was renumbered 1501, consistent with being the first of the series. (A car was converted to a lounge car and was numbered 1500 below the 1501. Apparently the 1502 and up series were already occupied by coaches, so the second lounge became 1500 rather than mixing it into the coach series. This concept went out the door a couple years later when more Stainless LW cars were converted to "entertainment" cars with tables and chairs. -Clinchfield 112, not renumbered but later named "J. Preston Claytor"
-Seaboard System 114, not renumbered but retaining name "Blue Ridge"
By 1989 the New Georgia had a fleet of 21 cars, including the two cars from CSX and minus the two DL&W cars that had been sold by then. Perhaps someone can add more information, but in my opinion, perhaps the most significant car on the New Georgia was former FEC round-end lounge-obs "Bay Biscayne". I have no information on who this car was purchased from, and I'm wondering if it might have been in the Nippert fleet. I'm looking forward to seeing Tim's Al Nippert roster info. In any case, when the NGRR shut down, two cars went to Stone Mountain Park, or more properly, I think, to the Stone Mountain Memorial Association for use on the Stone Mountain Railroad. These were NGRR 1508 (the Bay Biscayne, named "Steve Polk" on the NGRR) and I think the 1507, named "Stone Mountain Park". The "Bay Biscayne" eventually (in 2002) came to the S.A.M. Shortline Railroad and is now operated as the "Samuel Hawkins". It still carries the number 1508. The other car, a 1949 P-S product (ex-ACL coach 230 if it was actually the 1507 that went there), is either still at Stone Mountain or has been scrapped by the park. The 1989 Trains article shows NGRR car 1508 as the car that later became Coca-Cola 100, vacating the slot for the "Bay Biscayne" to fill, but I have no idea when the "Bay Biscayne" was acquired. Well, that's all for tonight...I'll be conductor on SAM Thursday. "Bay Biscayne", here I come! Yes, I bought the UP Coach 2002 for the Florida RR Museum (it was Florida Gulf Coast RR Museum at that time). The car remains in service on the museum train today and is currently painted Pullman Green. The museum members refer to it as "the New Georgia car". The car I really wanted was the MKT HW coach but KRM outbid me. In addition to the cars listed, Al Knippert bought some cars from the W. O. Savage estate here in Tampa. 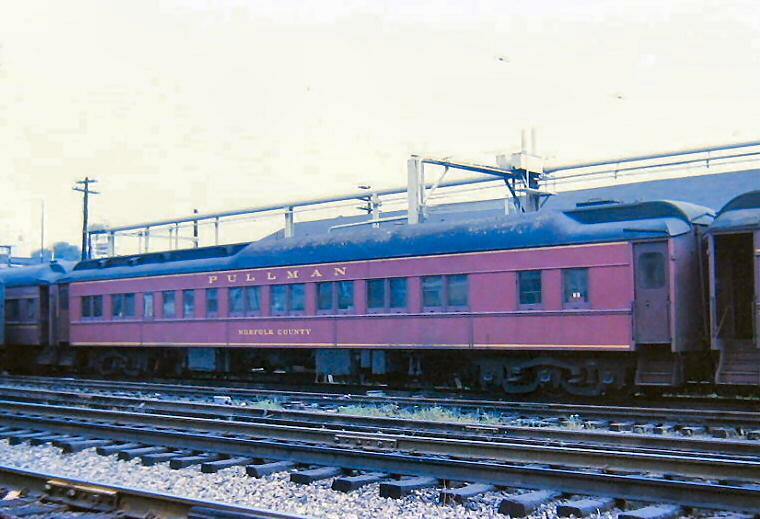 Those were the HW 10 sec Lounge "Norfolk County" and ex-SCL business car "Jacksonville" (nee- Pullman "Pioneer"). I saw both of them at French Lick several years ago. The "Jacksonville" had been partly stripped and was missing the railing from the rear platform, a real shame because this car was beautiful when Bill Savage had it. There may have been two other cars he bought at the same time but my memory is blank on that. Both of these cars, along with Frank Pollock's MKT coach and his ex-Reader 2-6-2 11 were used in the filming of a TV movie "Golden Honeymoon" here in Tampa in 1978. We ran the train from Tampa to Brooksville for the filming. In addition to the cars listed, Al Nippert bought some cars from the W. O. Savage estate here in Tampa. 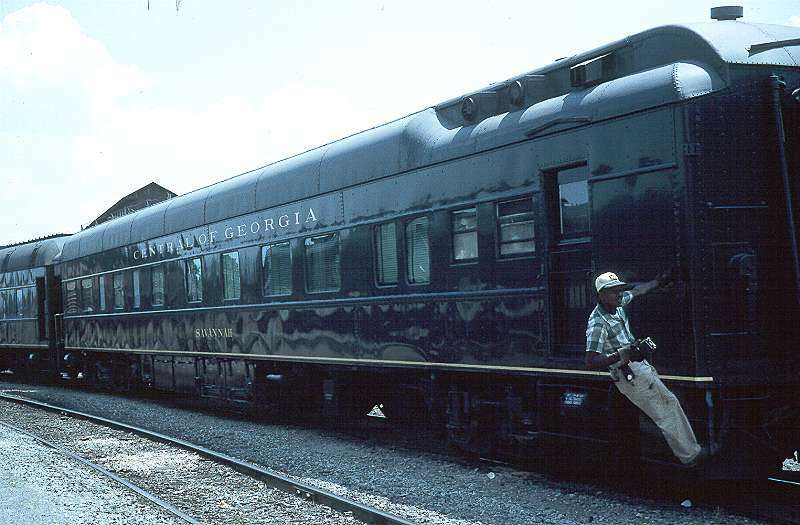 Those were the HW 10 sec Lounge "Norfolk County" and ex-SCL business car "Jacksonville" (nee- Pullman "Pioneer"). I saw both of them at French Lick several years ago. The "Jacksonville" had been partly stripped and was missing the railing from the rear platform, a real shame because this car was beautiful when Bill Savage had it. There may have been two other cars he bought at the same time but my memory is blank on that. Thanks, Jim, for the info! Hopefully sometime in the future the "Jacksonville" will be restored as the "Birmingham" has been! Originally named the "Mt. Wood", it was one of thirty 10 section buffet lounge sleepers built in 1926 by Pullman in Lot #4998 to Plan #3521A. Four of these were renamed after counties in 1937, and received N&W Tuscan Red paint in the 1950's. Of these four, N&W did not purchase any, either at the 12/31/45 or 12/31/48 divestitures, nor at a later date. "Mt. Angeles" to "Dinwiddie" 6/34 to "Dinwiddie County" 4/37. To Old Dominion Chapter NRHS 12/65. "Mt. Slyen" to "Nansemond" 6/34 to "Nansemond County" 5/37. To Midwest Steel 12/64. "Mt. Turnbull" to "Roanoke County" 6/37. To Hyman-Michaels 11/66. "Mt. Wood" to "Norfolk County" 6/37. The "Norfolk County" received an overhaul in 6/37, when it was renamed from "Mt. Wood", changed from Plan #3521A to #3521G, and had Pullman mechanical A/C (with a brine tank) installed. It was outshopped from said overhaul on 6/25/37. It was sold to Chapman S. Root (of Daytona Beach, FL) on 5/6/68. Does anyone know when Mr. Savage purchased the car from Mr. Root? "David Livingstone" to NYC 5/48 (numbered to #18 [2nd]). Sold to FCP 1956. "Henry Stanley" to AT&SF 1/44 (numbered to #20). To Pullman #200 "Louis W. Grant"?? I've compared window arrangements and other features, and that appears to be the case. Can anyone clarify? "Marco Polo" to CofG 7/44 (renamed "Savannah"). Current whereabouts? "Pioneer" to SAL 8/44 (renamed "Jacksonville"). Was the "Jacksonville" numbered #106 on the SAL early on? Now at the Indiana Railway Museum, and the ex-SAL business car "Birmingham" (ex-"Baltimore") is also on site. "Robert Peary" to CB&Q 6/44 (renamed "Blackhawk"). Renamed "Victoria" while under private ownership. Now at the Pacific Southwest Railway Museum as "Robert Peary". Additions and corrections are welcome. Thanks in advance. "Perhaps someone can add more information, but in my opinion, perhaps the most significant car on the New Georgia was former FEC round-end lounge-obs "Bay Biscayne". I have no information on who this car was purchased from, and I'm wondering if it might have been in the Nippert fleet." The Bay Biscayne was not a Knippert car. It was retired and stored in Los Angeles when sold at auction to Standard Industries of the Los Angeles area and used as part of their 5 car display train. All 5 cars sold circa 1988 to Jim Stephenson of Houston, TX, who sold the cars to various private owners. I think the Bay Biscayne was then owned by one or two other parties before sale to New Georgia. The Marco Polo is NS 30 and is usually at Union Station for business purposes. I have made up a spreadsheet of the Nippert cars that I have been able to assemble it from a)his list of 1983, 2) TVRM;s inspection of 1989 and all time roster, NGRR sale listing and IRM roster of 1990. I have not tried to cross reference it back to all of the postings here on RYPN. It is in excel and I have attached it. Lets see how it makes it through cyberspace. Thanks, Tim, for posting the spreadsheet roster! Ah-ha! That helps explain why I could never find anything about this car post-Amtrak! These DL&W numbers were also published in the Feb. 1989 issue of Trains magazine, which also reports they were sold in 1987. Should be one of the former Southern E8As painted in the quasi-Central of Georgia blue, silver and red scheme. RF&P 6DB buffet lounge sleeper #410 "Colonial Beach" constructed in 12/1949 by AC&F in Lot #3093 to Plan #9002 (for ACL pool service). To Amtrak in 1971 as #3228 and renamed "William A. Griffin, Jr." Retired 7/1981. Sold to Nippert at unknown date. To New Georgia RR at unknown date. Does anyone know who purchased this car at the NGRR auction in 8/1995? As reported in the "Surviving Southern LW Cars" thread, the 1102 (along with William Griffin, Jr. and Rappahannock River) was on jack stands at the time of the auction and the 1102 trucks went to Great Smoky Mountains while the body went to a private owner, along with the Rappahannock River body, to a farm in southeast Georgia. The 1102 was actually shown on shop trucks, and looking more carefully at my photo taken the day of the auction, it was definitely on shop trucks, not jack stands. Unfortunately, the result was the same for the car. Literally put out to pasture. The auction company's decision to sell the 1102 body separate from the trucks was the death of the car. In one sense, it was a practical decision to sell the cars that were off their trucks the way they did: there was no more money to be able to pay anyone to put them back together, and they wanted everything off the Pullman Shops property very quickly. But considering they got $18,500 for the intact 1101, it might have been worth a few thousand dollars to reassemble 1102, which sold in pieces brought only $6000 from the various notes I have and have been told. While looking for something else, I came across this photo of the Colonial Beach/William A. Griffin, Jr., which reveals (due to the fact that the trucks and body were sold separately) that the car never left the Pullman Shop, and as of 8/12/2007 it was still sitting up on blocks, heavily tagged and completely abandoned (at least no one has burned it, yet). Any takers? Iowa Pacific? Anybody? Time for a correction. Practically ever since the SAM Shortline acquired the former FEC tavern-lounge-obs car from Stone Mountain Park, the car numbered 1508 (apparently 2nd 1508) by the New Georgia, was believed to have originally been the FEC "Bay Biscayne." That now appears to not be the case. When researching the car I was unable to locate any information regarding the other FEC car built at the same time as the "Bay Biscayne," the "Lake Worth." Using photographic evidence and every other resource I could come up with, through a basic process of elimination, lacking any information found regarding the disposition of "Lake Worth," the SAM/ex-Stone Mountain/ex-New Georgia car had to be the "Bay Biscayne." It is not. It is the "Lake Worth" as initially stated last ear (2014) by the man who looked at the car for the New Georgia, and soon thereafter confirmed by a friend who worked for the New Georgia and knew all along about my screw-up! Oh, well. So, my apologies for all the incorrect references to "Bay Biscayne" being on the New Georgia up to the SAM Shortline ownership. The references should read "Lake Worth." Also, there is some indication from this same friend that the numbers/identities of the two ex-MKT cars are not correct. Maybe he will see this and comment in that regard, as I do not have current contact info for him.